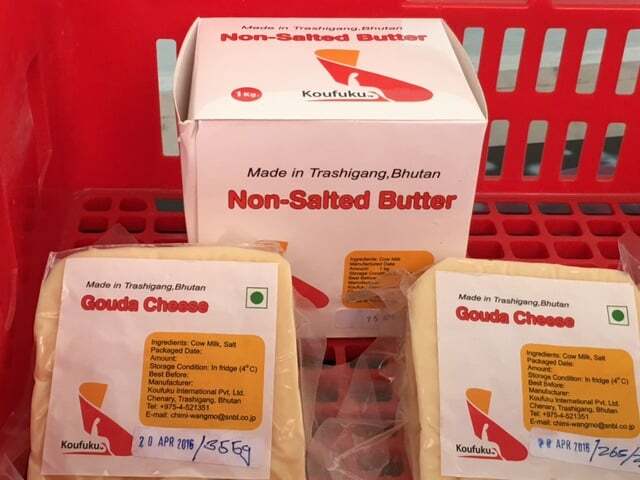 My Bhutan adventure continued with very special gourmet experience. I was invited by the owner’s of the Lingkhar Lodge to have a delicious lunch at a local Culinary school. The owner had decided to take the course herself so she could offer her guests a wider range of authentic dishes. It was certainly scrumptious, a real treat! 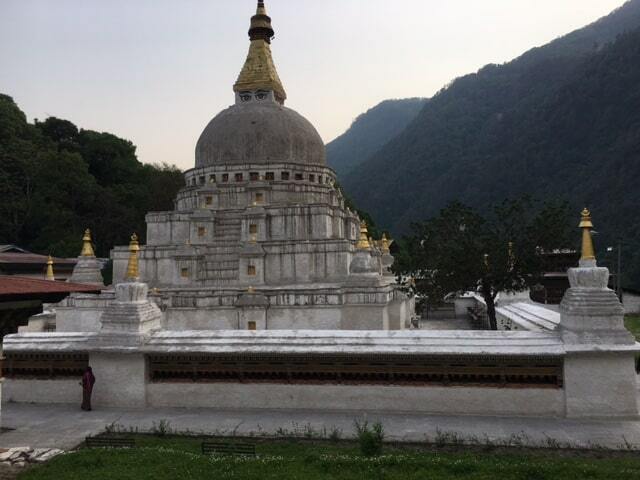 With a full belly we headed to the Gom Kora Temple just outside of Trashigang. Legend has it that Guru Rinpoche, who was a Buddhist saint from the eighth century, meditated here before leaving an impression of his body on a rock. The temple is set in a beautiful location and adorned with murals and some ancient treasures including a Garuda egg and a footprint of the Guru’s horse. From there we visited Chorten Kora, a Buddhist stupa that is similar to Boudhanath in Kathmandu. It was built in the 18th century by Lama Ngawang Loday to ward off spirits and commemorate his late uncle. Legend has it that the Lama visited Nepal and carved a picture of the Boudhanath into a vegetable so that it could be recreated in Bhutan. The next day we went to Mongar, a district that is famous for it’s deliciously scented lemongrass. On our way we stopped at Koufuku International, which is a dairy processing plant. 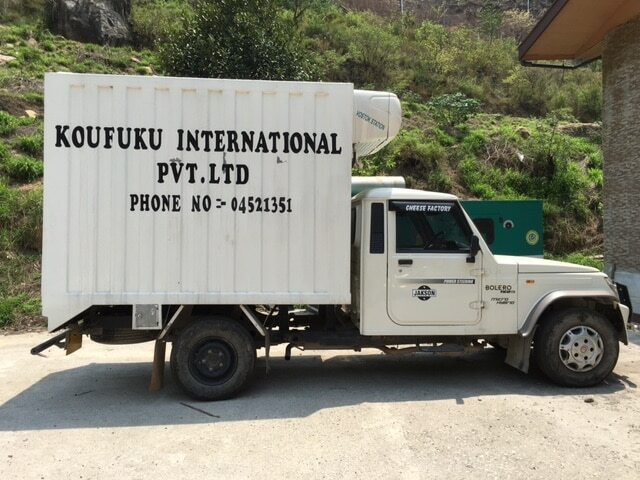 It is a collaboration between a Japanese and Bhutanese company, a partnership that has been very beneficial to the local community. The project provides farmers with a reliable and convenient outlet to sell their dairy produce, with the flow on effect of improving the economy of the district and the quality of life of its residents. During our visit to Mongar we walked around the tranquil town and visited the bustling market before heading back to the hotel. 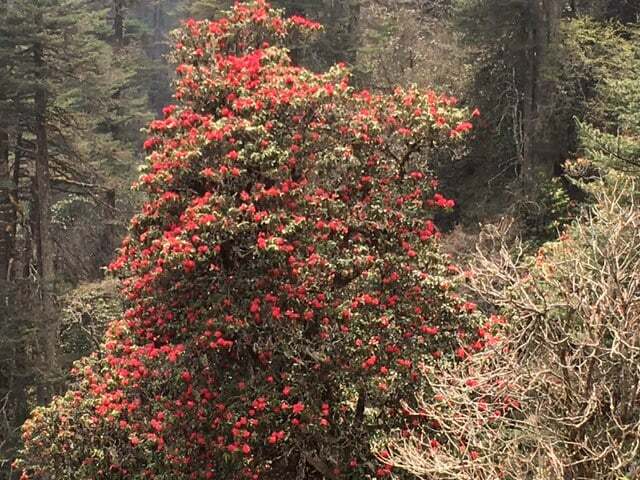 The next day we rose early to drive to Bumthang, which is home to some of Bhutan’s oldest temples and monasteries. 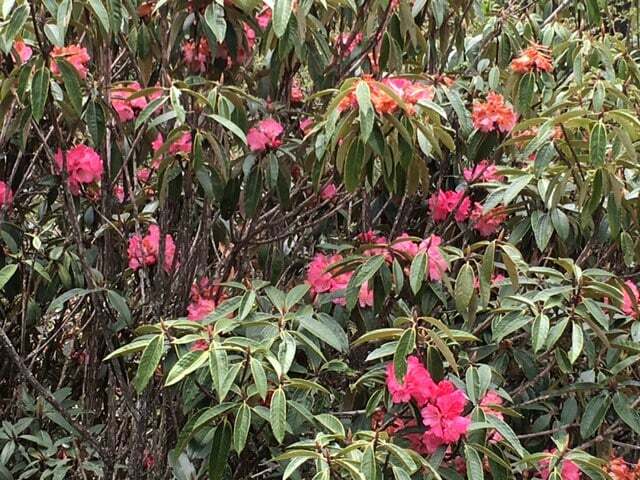 On our way we passed some lovely waterfalls and many resplendent red rhododendron bushes. 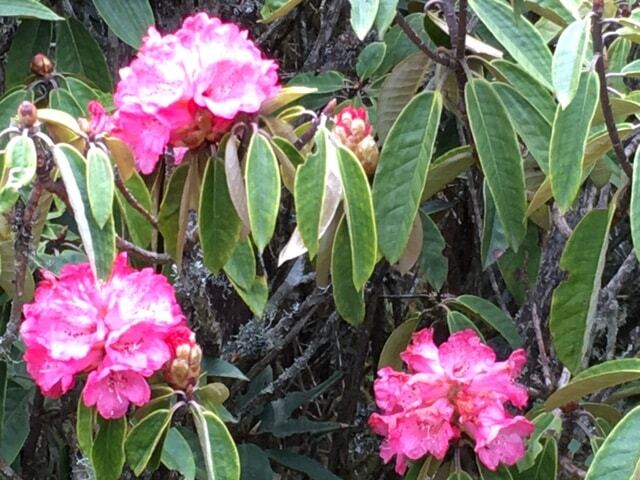 While it’s not the national flower, Bhutan has over 50 species of rhododendron. 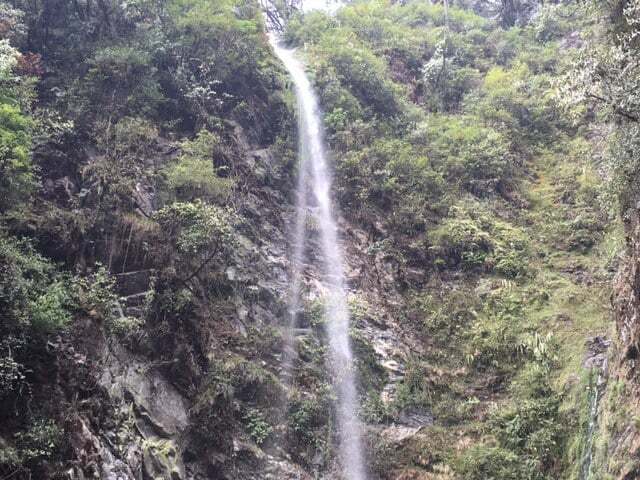 The region also has rolling verdant hills and valleys that makes it perfect for agriculture. We spent the night at the Mountain Lodge. This recently renovated hotel had a very comfortable new area that was finished in detailed stonework. 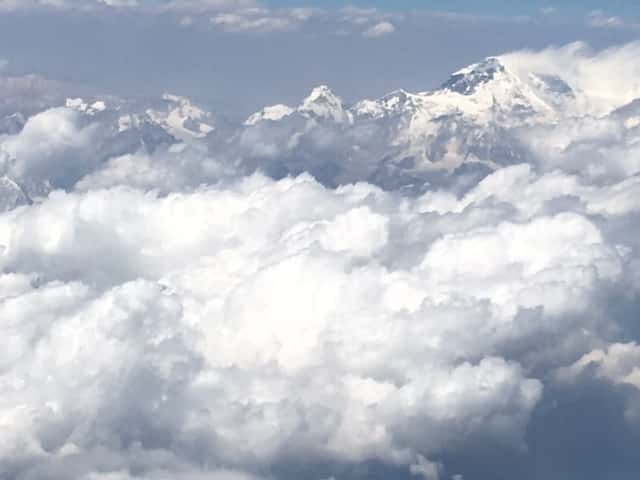 From Bumthang we caught our flight to Paro the next day, where I was able to squeeze in a little last minute shopping before the final leg of my journey. 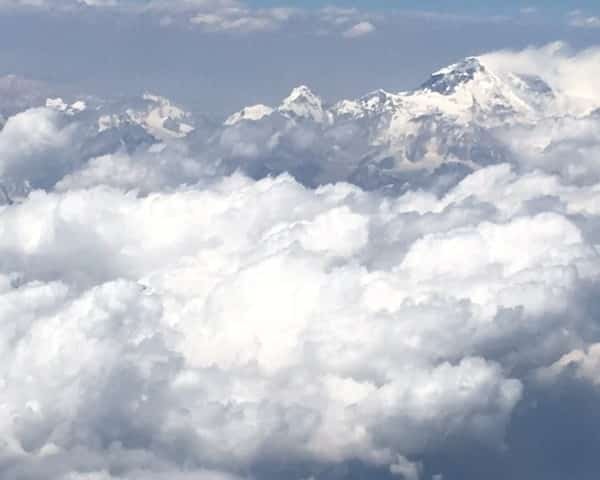 And I was lucky enough to catch a glimpse of Mt Everest and the spectacular Himalaya snow capped ranges from the airplane (the triangular peak in the background is Everest). While I was a bit sad that this trip to Bhutan was coming to an end, it was such a special trip. Seeing the east of the country through Lhatu and Sangay’s eyes, people who grew up there, was something I’ll treasure. But now Delhi was beckoning.